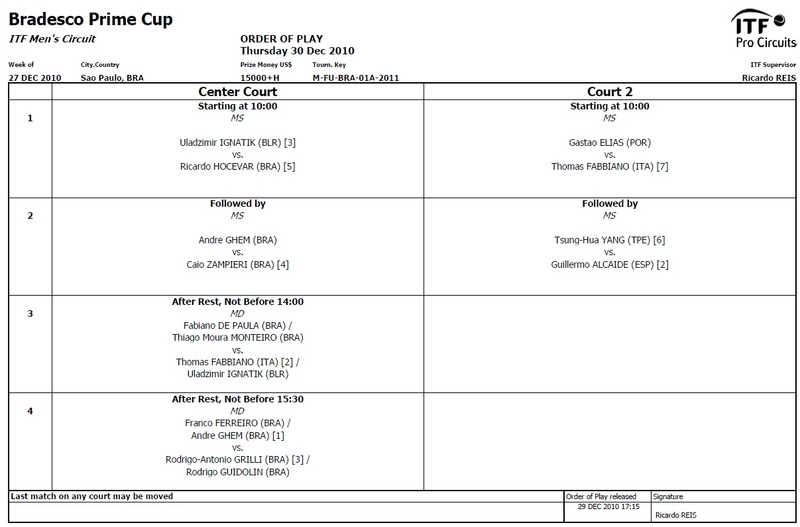 So, an actual full slate of singles play took place at the Sao Paulo Challenger today (well, almost, haha), and – on the off chance that my nauseatingly-detailed tweets weren’t enough for you (or you missed all of my 140-character gems entirely) – I will now provide a nauseatingly-detailed recap of Wednesday’s action out of the goodness of my heart. And at no extra cost to you, dear reader! Well, I woke up and was writing my snarky preview about how there’d be no tennis today. 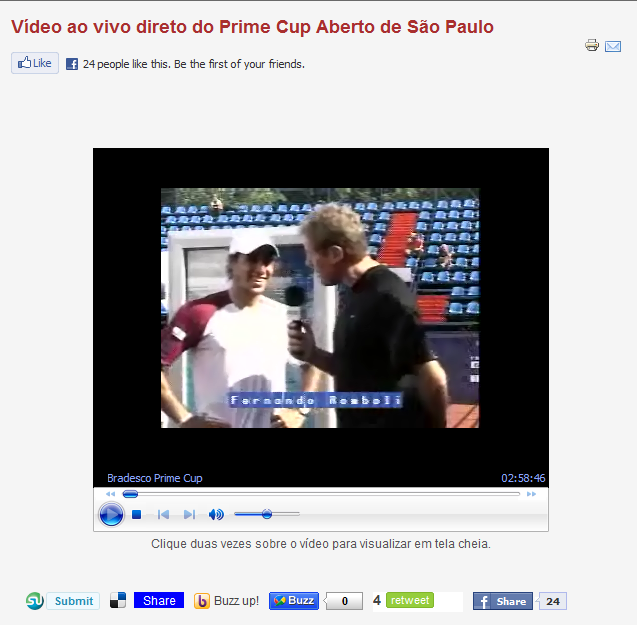 When all of a sudden, on a whim, I decided to launch livestreams and scoreboards and stumbled upon a minor miracle: after days of deluge, there was play in Sao Paulo! Hallelujah and praise Jesus (that’s the guy with the squeegee’s name, I’m pretty sure: Jesus Silva, no doubt). 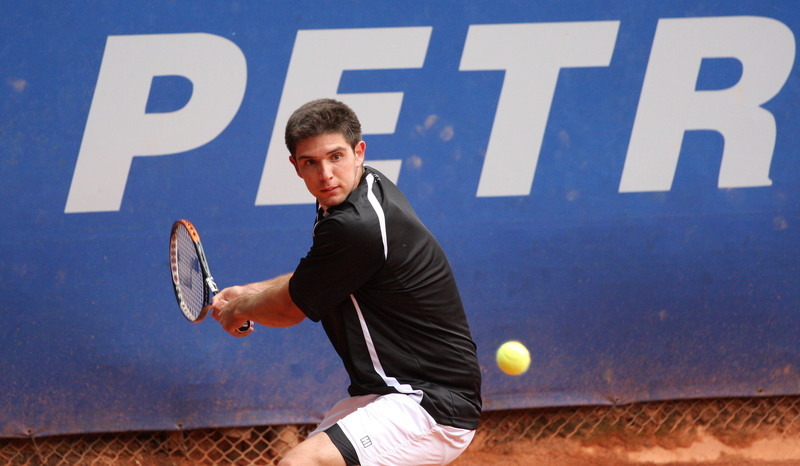 We joined the action with Federico Delbonis (one word, the ATP spells it wrong – thanks Marcos for the tip!) leading Tiago Lopes 7-5, Guillermo Alcaide over Daniele Giorgini 6-3 2-3, Giovanni Lapentti in a first set tiebreak with Ricardo Hocevar, and Joao Souza warming up with Matteo Trevisan on the postage stamp-sized livestream. 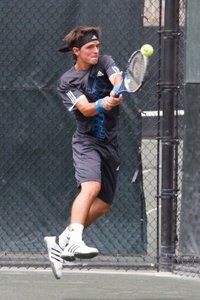 It wasn’t long before the seventh seeded Delbo had closed out his match in dual 7-5 sets, while Alcaide wrapped up his match in three, winning 6-3 4-6 6-3. As it should have done after several days delay, the tennis was coming faster and furiouser than Vin Diesel on a Wayne Odesnik hypodermic cocktail. Before I knew it, Souza had come back from a set down to win the second set 6-3 with a hearty cry of “Vamos!” for good measure. Trevisan was then sprayed/rubbed and otherwise fondled (and possibly deloused) in the legular region, MTO-style. 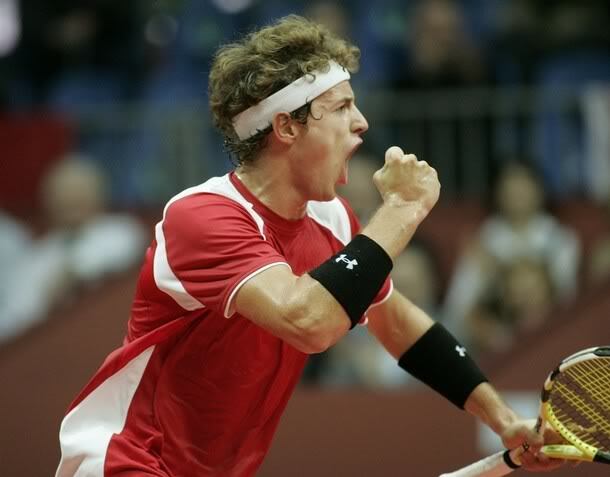 And before I knew it (again), Souza had closed out the match (this time with a hearty cry of “Allez!” – such variety!) 4-6 6-3 6-1, much to the delight of the local crowd. But the real question we need to ask here is: why did things keep happening before I knew them? A disturbing trend, to be sure. 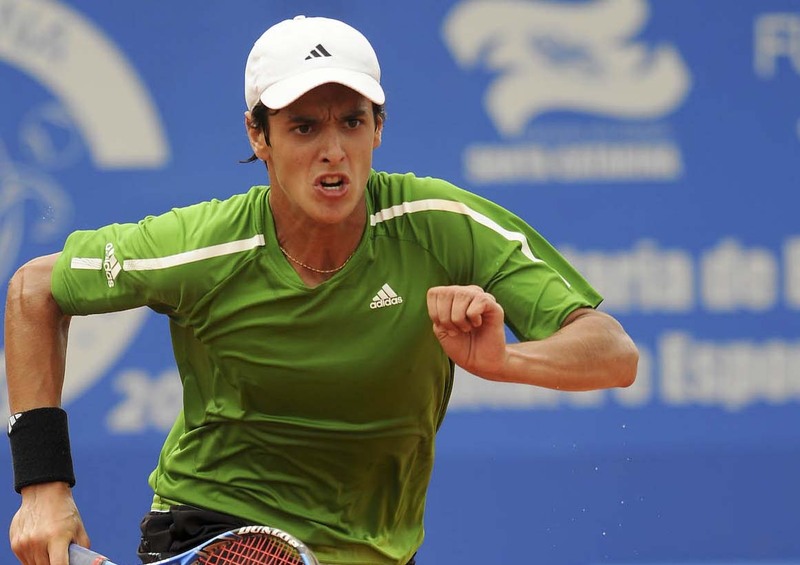 Anyway, the 3rd-seeded Souza will play Giovanni Lapentti, who beat Ricardo Hocevar 7-6(6) 6-4 in the 2nd round. Lapentti leads their head-to-head 3 to 2. And then the still-Swedish wildcard Christian Lindell made it into my livestream crosshairs against the always-Argentinian Andres Molteni. Lindell dictated play early, serving 4 aces, ruling rallies and racing to a 4-1* first set lead. Molteni was muttery. Meanwhile, on another court, I notice that Uladzimir Ignatik has bageled eighth seed Paul Capdeville in the third set, getting the upset 7-5 3-6 6-0. Later I learned that Capdeville had been sick and cramping in that final set. Oh. Also meanwhile on another court, Horacio Zeballos was upwarming for his match against Julio Silva. Why the second seed was scheduled to play a Brazilian on any court other than Court Central left me mystified and bewildered. I mean, I know they’re backlogged with matches, but only 4 total contests were even scheduled on the main (and streamed) court today, with 5 matches on all the others. Surely they could’ve made some room for their second seed, no? No. Regardless, Molteni started to make a good go of it on Court Central while he was there (and why not?). He charged back in the 2nd set, served to force a tiebreak, and found himself at triple set point 6-3*. Lindell held to 5-6*, but then Molteni netrushed and Lindell melted, making an error of induction on set point numero tres. Second set to Molteni to the 22 year-old Argie, 76(5). Brazil F1 Semifinals Are Set! If you’re a good headline reader, as I suspect you may be, then you’ll know that the semifinals are now set for the Brazil F1 tournament. You’ve also rendered the first sentence of my article completely worthless – I hope you’re happy! You may have also guessed that if the semifinals are set, that means the quarterfinals have been played. Wow – you’re on a real roll today, aren’t you, champ? Yes, the quarterfinals have been played, and – as my twitter sidebar would only be too happy to tell you – Andre Ghem defeated fourth-seeded Caio Zampieri 6-3 6-4, 6th seed Tsung-Hua Yang beat 2 seed Guillermo Alcaide 3-6 6-2 6-1, 3rd-seeded Belarussian Uladzimir Ignatik overcame  Ricardo Hocevar 3-6 7-6(4) 6-4, and unseeded Gastao Elias upset seventh seed Thomas Fabbiano 3-6 6-1 6-2. As you can see, four different nations are represented in our first semi of the season. Andre is the only remaining home country Ghem after knocking out two of his other compatriots – Charles Costa and Daniel Silva – in the first and second rounds in addition to Zampieri in the QF’s. But, hey, it was either them or him, ya know? Certainly can’t blame the guy. 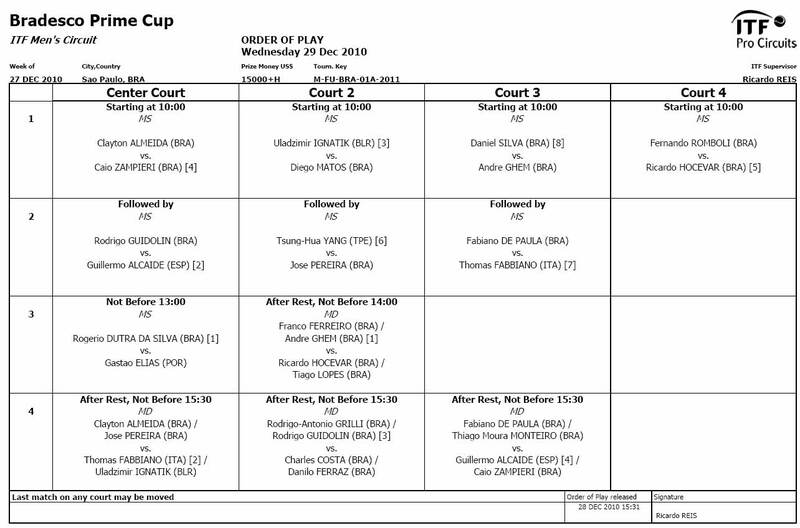 Unsurprisingly, this will be the first meeting between the 28 year-old Sole Remaining Brazilian and his 19 year-old Taiwanese opponent (and 2011 Challenger Tennis Player To Watch), Tsung-Hua Yang. I, of course, can go on and on about the different paths and fates of the above-listed players. But for now, suffice it to say that Ricardas Berankis is now down at the Brisbane International ATP 250 and is now known as “Richard”, and Gastao and Uladzimir – who apparently was once known as “Vladimir”? – are slugging it out in Sao Paulo. So much can change in a year, eh? Or even three years, for that matter. Which is when these two last met, in a rather exotic locale: Iggy defeated Elias 6-3 1-6 10-3 in their only previous meeting, at none other than the 2007 Wimbledon Boys Quarterfinals. Bonded by spreadsheets! Steeped in lawn-tennissed traditions! It will be interesting to see what the Futures hold for them today. 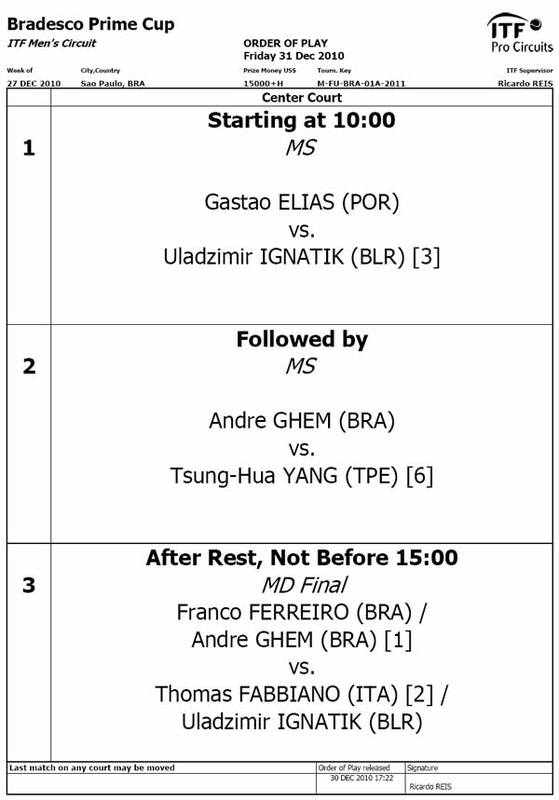 For me, there are three marquee matches today, and none of them is Andre Ghem vs. Caio Zampieri. But it’s a BRA vs. BRA situation – and you know how that goes in the ol’ Sao Paulo. Right, bra? Regardless of my ignorant opinion, the two players have played three previous matches – all of them in 2005, mind you, when Ghem was 23 and Caio was 18. For what it’s worth, Ghem leads their head-to-head 2 to 1. Will the fourth seed be able to even up their H2H when they renew their five-years-dusty rivalry? Probably, I’d say. You might be surpised to learn that third-seeded, 20 year-old Belarussian Uladzimir Ignatik has met fifth seeded, 25 year-old Brazilian Ricardo Hocevar one time before. But would your surprise diminish once you learned that Iggy trains in Brazil? It should. In any case, Ignatik won that previous meeting of theirs 6-3 6-3, in the second round of the Salvador Challenger in August. The once-touted (by me, anyway) Ulad has gone from a sparkling 65/25 2009 season to an abysmal output of 30/33 “last year” (hohoho). I’ll be interested to see how he goes in the new season. And today. Which, in Brazil, is the same thing. As he been reported earlier, I am pretty darned pleased to see Gastao Elias getting good results here in the new year (shhhhh). Gastao has been training in Brazil with new coach Rodrigo Nascimento, and seems to be reaping early rewards from this arrangement. The just-turned-20-year-old Portugeezer upset top-seeded Rogerio Dutra Da Silva yesterday and looks to continue his run today against seventh seeded Italiano Thomas Fabbiano. Though the two have never met in singles, they did team up together in juniors once, making R16 in Rohampton dubs in ’06. Rodrigo Guidolin vs.  Guillermo Alcaide: Guidolin won their only previous match 6-3 6-4 in the ’09 qualies of the Belo Horizonte Challenger. Fabiano vs.  Fabbiano: they’ve never met, I just wanted to point out their names. Will post results as I get them. Assuming I haven’t gone back to bed, that is. Update: Darn it! I’m always wrong with my elliptical insinuations… Ricardo Hocevar ends Fernando Romboli’s 11-match winning streak 7-5 4-6 6-1. Seems like Fernando might have run out of gas in that third set. And who could blame him? Back-to-back-to-back tournaments over 2.5 weeks of winning, seeing his ranking rise 61 spots to #287. It was a good run, and I’m designating Fernando Romboli an official Player to Watch as of this sentence. Congrats on your excellent streak, champ! 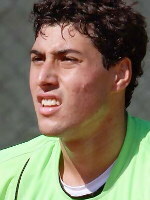 Other results: Andre Ghem upset  Silva 7-5 2-6 6-2 and will face  Zampieri, who beat Almeida 6-4 6-4. Translated article here.